Toufayan Mini Pitettes® are a bite size version of Toufayan’s original Pita bread. Hearth baked to a perfect golden brown, Mini Pitettes® are perfect for parties and holidays. They’re great for hors d’oeuvres, snacks, or mini sandwiches. They can be used flat to hold toppings, or stuffed with your favorite fillings. They’re great for tacos, sloppy joes and fajitas. Or just cut into bite sizes for appetizers. About how big (in diameter) are these? Our Hearth Baked Mini Pitettes® vary in size anywhere between 2.5″ – 2.75″ in diameter. 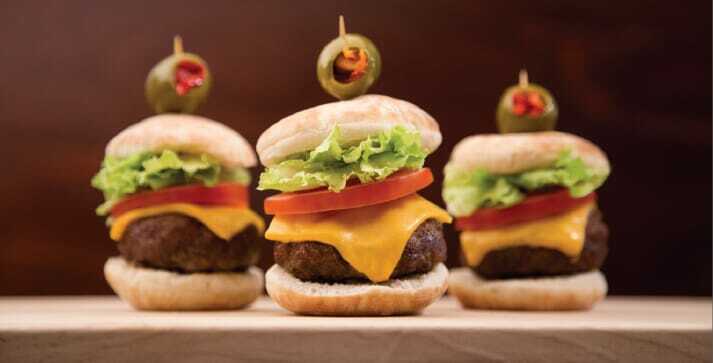 We personally love to use them for homemade mini-sliders. I want to order your gluten free Lavash on line, but I haven’t been able to. Your on line sight gives a lot of information about all your products, but no delivery. Meaning, there is no indication of the price, nor where to buy it, or how to purchase on line. You only show a map of the United States with different shades of gray for all the states, but it doesn’t give which shade of gray sells your Lavash, or the name or the phone #. One store in CA is mentioned but it says it’s closed today. The on line sight should sell your lavash or any of your product automatically even when the shop is closed, and that’s how the online stores make a lot of money, instead of telling customers to call you when you are open which slows down high percentage of the sell of your products. Too much information with no conclusions, zero sells. & waste of everybody’s time. Hello Afi and thanks so much for your comments. Please ask your store manager to carry your favorite Toufayan products. Meanwhile, you can try your local Stop & Shop or Walmart. You can use our Store Finder, we are regularly making updates to help you find your favorite Toufayan products! Let us know if you still can’t find Pitettes in your area. Hello! What’s the best way to store the mini pitettes once the package is opened? Do they freeze well? Thanks! We have found that they do freeze well, just ensure that they are well sealed before placing them in the freezer. A vacuum sealer works well or plastic freezer bags with the air carefully removed. You will also find that it is better to chill them in the refrigerator for at least twenty minutes before placing them in the freezer, to reduce condensation. When you defrost them, a slow defrost overnight in the refrigerator works well too! For short term storage, we use a resealable freezer bag, or a simple twist tie to hold them closed in the breadbox (they usually get eaten before long anyway). Hello, Kroger stores in Dallas, Tx stopped carrying the mini petite. Which other stores carry them in Dallas? Also, can we order on line your products? Hello Miranda, sorry to hear your store stopped carrying Mini Pitettes. Don’t be shy, ask your store manager to add them back to their inventory. Also, you can check with other Krogers in your area, and Fiesta carries the Mini Pitettes, as well. Right now, we don’t offer the Mini Pitettes online, but you can make a special request by contacting us at info@toufayan.com. I enjoyed the Pitettes while visiting family in Florida but can’t find them at home! Can you tell me if they are available in Northeast Ohio? Hello Debbie. Right now our Pitettes® aren’t available in Ohio markets, but you can find our other great products at Heinen’s, IGA, Jungle Jims, Meijer, Remke-Bigg’s Shop n’ Save and Spartan Stores. Make sure you ask your store manager to add Pitettes® to their inventory! If you’re near a BiLO, Foodtown, Shoprite or Weiss, they should have our Pitettes® available. You can also check our where to buy page to see stores in your area and what Toufayan products they carry. Do you sell to foodservice? I have a customer looking for the pitettes, so i will need vendor information such as vendor minimums, shipping address, prices, etc. please contact me. Hello Dianne and thank you for your interest. Please take a look at our food service page. You can use the contact form there or email us at info@toufayan.com. Modern, simple, delicious and quick, try these little bites at your next gathering or party.